December is one of our biggest months, and the December 13th reading clubs are just a few short weeks away! We'll need a total of 580 volunteers (and two more Santa's helpers), so please start recruiting as many friends, co-workers, etc. as you can. To get started, sign up today. Then join our December 13th Facebook Event so your friends will see that you will be attending. Please also start emailing and posting on your Twitter/Facebook/Instagram/ etc. that we need more volunteers. 4) Santa will be attending!! If each of our volunteers recruits two friends to join us at our December 13th reading clubs, we can reach our volunteer goal. COMMENT ON FLUOR'S BLOG AND HELP US WIN $10,000! This past summer, Reading to Kids was selected as one of 15 U.S. finalists for Fluor's Global Community Project Fund, and your votes helped us win a $10,000 grant! As part of that project, 13 Fluor employees read aloud to children at Magnolia Elementary on November 8th, while another Fluor employee talked to parents about the importance of science and technology-based fields of study. 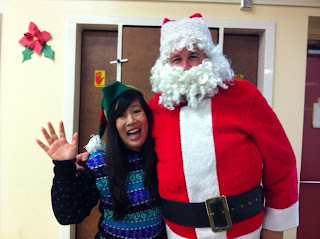 Go to Reading to Kids volunteer and Fluor employee Jinhwa Chun's blog. Use the GlobalCommunityProjectFund link in the upper right to submit your comments or questions about our project's progress. At the end of the year, an additional $10,000 "Best-in-Class" award will go to the benefiting organization of the project that demonstrated the most progress, employee support, impact, and visibility in their local community and beyond. Please show Fluor your enthusiasm for Reading to Kids! Your comment may be featured on her blog, where you can also see great photos from the Nov. 8th reading clubs. The kids are excited to meet Santa at each of our schools at our December 13th reading clubs. We still need two more volunteers to dress up as Mrs. Claus or one of Santa's helpful elves. Santa's elves can be any shape, size, color, or gender. There's nothing better than seeing the students' excitement when Santa visits our reading clubs! If you are interested in being Mrs. Claus or an assisting elf on December 13th, please contact us at info readingtokids.org. You won't be able to read that day, but you'll see hundreds of smiling faces! The Santa suits will once again be generously provided by the Pasadena Jaycee's Operation Santa. If you are interested in volunteering for this wonderful project, please click here for more information or email them at OperationSanta@PasadenaJaycees.org! Thanks to early donations, we have raised $19,075 from 223 donors! Our overall goal by the end of the year is to raise $45,000 from 500 donors. All of our donor's names are posted to our 2014 Annual Fund Drive page. Read on for how you can have your name added! 1 - Donate by check or online today. Contributions of any amount are greatly appreciated! 2 - Show your support by asking friends and family to contribute! Visit our 2014 Annual Fund Drive page and look under the "Help us Fundraise!" header for resources. In particular, please consider personalizing and sending the provided sample email to friends and family, or posting our handy donor sheet. 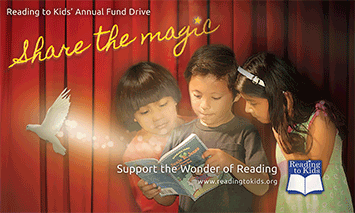 Become a Reading to Kids Angel by gathering 10 donations from others! Double your donation by asking whether your workplace matches donations. In this way you not only raise more money, you also share with others your enthusiasm for Reading to Kids! We want to thank The Playa Foundation for providing us with $2,000, their sixth grant since 2009. Their support will no doubt further the Playa Foundation's mission of "nourishing children's health, education and welfare" by partnering with non-profits.